Why expecting sales reps to prospect, cultivate, and close is unrealistic and hurts the quality of the resulting business. The challenges posed by leads that are TOO qualified and the huge opportunity missed through BANT qualification. How your lead-gen registration forms could be costing you business and why you should consider trashing them. The process changes some companies are making to significantly reduce their percentage of disqualified leads. Discounts can seem like a small price to pay to capture revenue. But for many, giving in to pricing pressure is having disastrous impacts on profitability. In this on-demand webinar, learn five strategies leading teams are using to win more revenue...without crushing their margins. 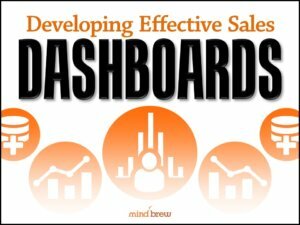 How do you develop performance-enhancing dashboards that salespeople will actually want to use long after the novelty has worn off? In this on-demand webinar, learn 15 strategies, tactics, and tips others have found effective. In this guide, you'll learn about the most common and costly prospect targeting mistakes that other B2B companies have made...so you can avoid making them yourself.